CoWorker Derek is back with a vengeance. I had an experience with an Amy’s meal that, well…It didn’t go well. But this Mexican bowl looks like I could be pretty alright. I’ll defer to Derek on that, though. It looks layered, which I appreciate. It also seems to have a nice helping of cheese, which is always good. Overall it just looks like really fresh ingredients. And that’s Amy’s deal. It’s all natural and all organic. The finished product though? It’s plain to see it looks pretty good. A lot more corn than what’s portrayed on the package, but corn is good. What’s Derek think? First and foremost, Derek’s a big fan of the ingredients. He appreciates the fact that everything in the meal was a food, and not some unpronounceable chemical. This is important to a lot of people. 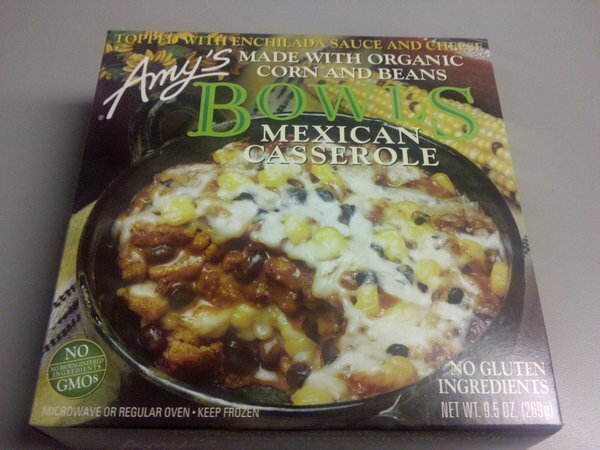 While I didn’t enjoy the one Amy’s meal I had, I’m still interested in trying more for this very reason. He also enjoyed the flavors and noted that the spice in the meal was very nice. He thinks a good way to eat it would be with tortilla chips. I might have to try that. 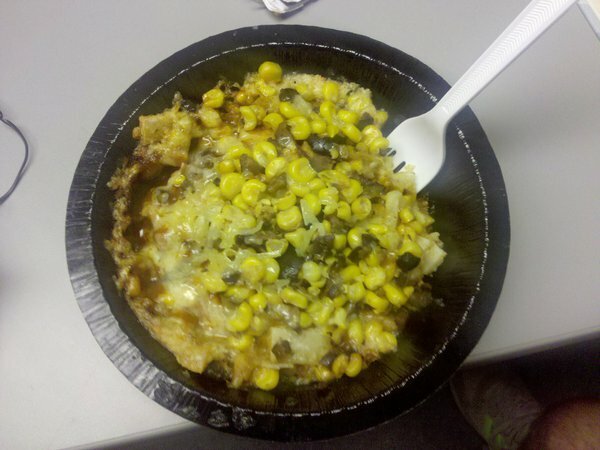 In all Derek doesn’t eat a ton of frozen meals, but this one definitely to stand near or at the top of the mountain. 0g Trans Fat/No Added MSG/No Preservatives INGREDIENTS: FILTERED WATER, ORGANIC CORN, ORGANIC CORN MASA (ORGANIC STONEGROUND CORN, TRACE OF LIME), ORGANIC BLACK BEANS, MONTEREY JACK CHEESE (PASTEURIZED MILK, CULTURE, SALT, ENZYMES [WITHOUT ANIMAL ENZYMES OR RENNET]), OLIVES, ORGANIC TOMATO PUREE, ORGANIC ONIONS, ORGANIC SWEET RICE FLOUR, EXPELLER PRESSED HIGH OLEIC SAFFLOWER AND/OR SUNFLOWER OIL, SPICES, SEA SALT, ORGANIC GARLIC, CILANTRO. Contains milk. Just tried this the other night when too tired to cook and WOW, it was just delicious!! It only cost $4.99 at my local WFM. However, a more careful look at the ingredients above will reveal that the cheese, olives, spices, oil and cilantro are not organic. As long as the corn and masa are organic, I’m gonna keep buying this tasty lil dish!! I like this one too. Looks nasty, but tastes delicious.